Emergency Lighting Inverters - CORE POWER INC.
Meeting the NFPA 101 and NFPA 111 standards, the “ELN” is considered “Life Safety Equipment”. The “ELN” is also UL 924 listed as “Emergency Lighting Equipment”, providing the required 90 minutes of emergency backup power. This unit provides uninterrupted, regulated, continuous sinewave output for use with “normally on” lighting fixtures and exit lamps, as well as standby output for use with “normally off” emergency lighting fixtures. It is also generator-compatible. With a front-access design and a small footprint, the “ELN” is suited for wall- or floor-mounted installations. 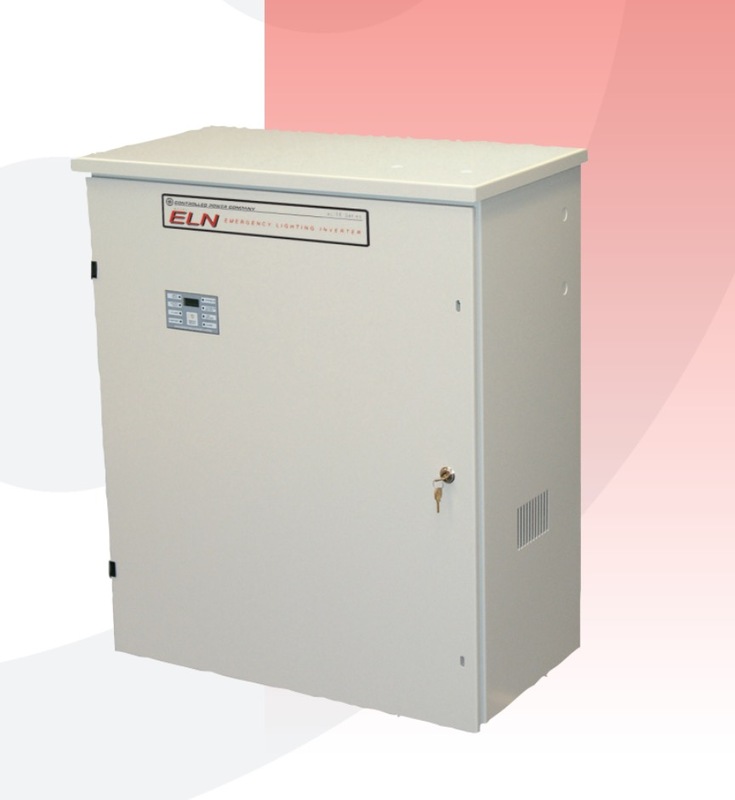 Available in 550W to 1500W single phase sizes, the “ELN” is ideal for schools, athletic fields, shopping centers, parking structures, churches, restaurants, theaters, hotels, and many other similar applications. The Model ELC’s compact front access design features one of the smallest cabinet footprints in the industry! Meeting the NFPA 101 and NFPA 111 standards, the Model ELC is considered “Life Safety Equipment”. It is also UL 924 listed as “Emergency Lighting Equipment”, providing the required 90 minutes of emergency backup power, and is 100% compatible with all lighting applications and life safety systems. The Model ELC provides uninterrupted, regulated, continuous sinewave output for use with “normally on” lighting fixtures and exit lamps, as well as standby output for use with “normally off” emergency lighting fixtures. It is also generator-compatible. The Model ELC’s voltage regulation and performance characteristics make it an advantageous choice over competing lighting inverters. Whether fed from the AC power source or even while in battery mode, the ELC has a peak overload capability of 1200% to accommodate inrush current from LED fixtures! Available in 600W to 2kW single phase sizes, the UltraLITE Model ELC is ideal for schools, parking structures, hospitals, retail facilities, apartment buildings, worship facilities, and many other similar applications. Meeting the NFPA 101 and NFPA 111 standards, the “UltraLITE Model ELU” is considered “Life Safety Equipment”. It is also UL 924 listed as “Emergency Lighting Equipment”, providing the required 90 minutes of emergency backup power, and is 100% compatible with all lighting applications and life safety systems. The Model ELU provides uninterrupted, regulated, continuous sinewave output for use with “normally on” lighting fixtures and exit lamps, as well as standby output for use with “normally off” emergency lighting fixtures. It is also generator-compatible. The Model ELU’s voltage regulation and performance characteristics make it an advantageous choice over competing lighting inverters. 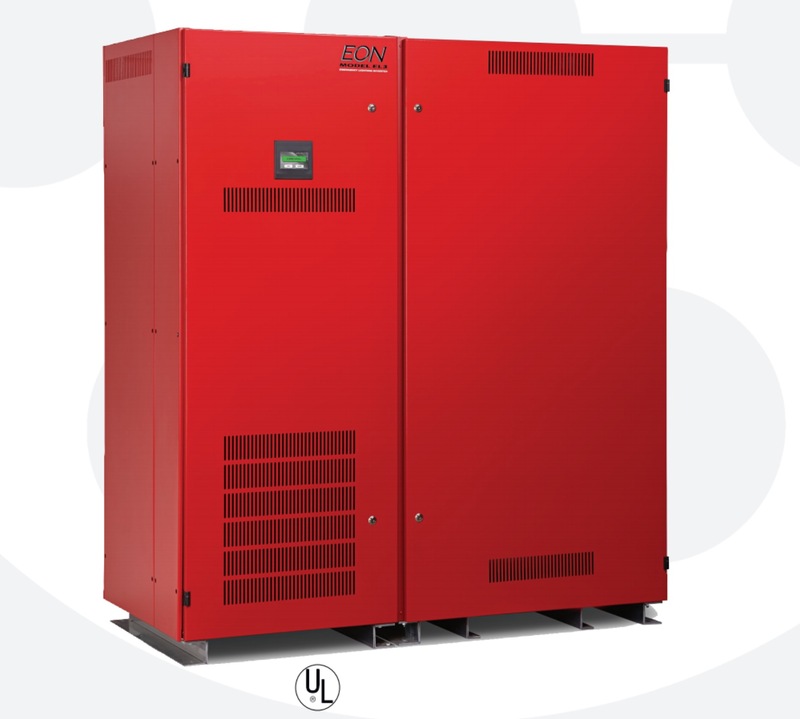 Available in 1.5kW to 14kW single phase sizes, the “UltraLITE” Model ELU is ideal for schools, arenas, subways, parking structures, hospitals, airport terminals, and many other similar applications. The eLITE model ELE is a modular, no-break, front access, single phase centralized emergency lighting inverter that provides conditioned and regulated power to normally on and normally off fixtures. The eLITE Model ELE is listed to “UL 924 Emergency Lighting Equipment”, “UL 924 Auxiliary Lighting and Power Equipment”, and “UL1778 Uninterruptible Power Supplies” standards. 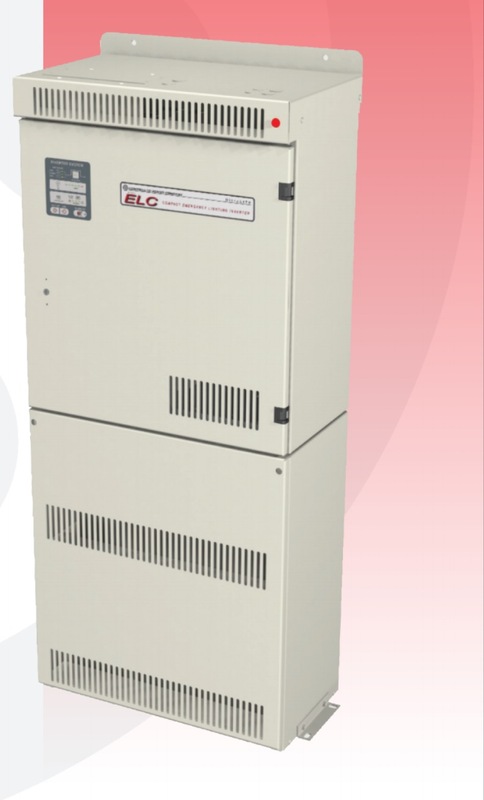 The eLITE Model ELE is also compliant with NFPA 101 and NFPA 111 requirements for testing of emergency lighting inverter systems. Meeting stringent design and performance specifications, the self-diagnostic, self-testing EON is UL 924 listed as “Emergency Lighting Equipment” and “Auxiliary Lighting and Power Equipment”, as well as NFPA compliant as “Life Safety Equipment”. The EON meets NFPA 101, NFPA 111, NEC and IBC requirements, and provides the industry’s most advanced life safety system testing available! Key EON options include output distribution with either monitored or unmonitored circuit breakers, normally off bus for standby (normally off) emergency light fixtures, and wrap-around maintenance bypass options that include a padlock attachment for lockout / tagout purposes during maintenance. In addition, the optional NetMinder™ provides remote inverter status, monitoring and communications via BACnet, Ethernet, MODBUS TCP, or MODBUS RS485. 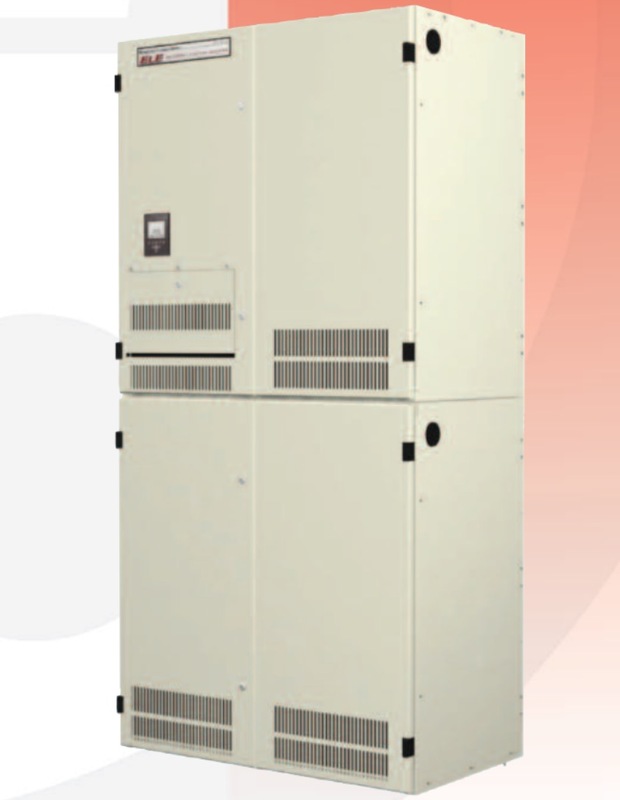 The EON model features one of the smallest three phase cabinet footprints in the industry! 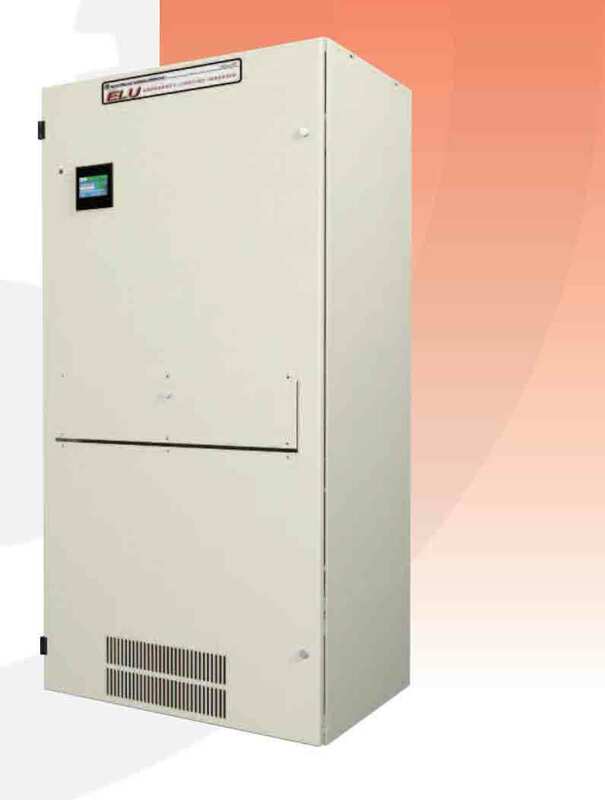 See how our 90 minute 33kW Inverter cabinet footprint compares to others! Learn more about the “NFPA 101 Life Safety Code”, UL 924 listings, on-line and standby off-line lighting inverter topologies, as well as how our inverters meet (and can exceed!) NFPA 101 … read our “Egress Lighting Solutions” brochure! And for our Canadian customers (including specifying engineers, lighting designers, and distributors), read our CSA / NBCC compliance addendum, which supports the selection and application of our emergency lighting inverters in Canada! The SwitchLITE Model EZT, a UL 1008 listed Automatic Transfer Switch for Emergency Lighting Applications, allows dimmable lighting fixtures to function as essential emergency lighting. 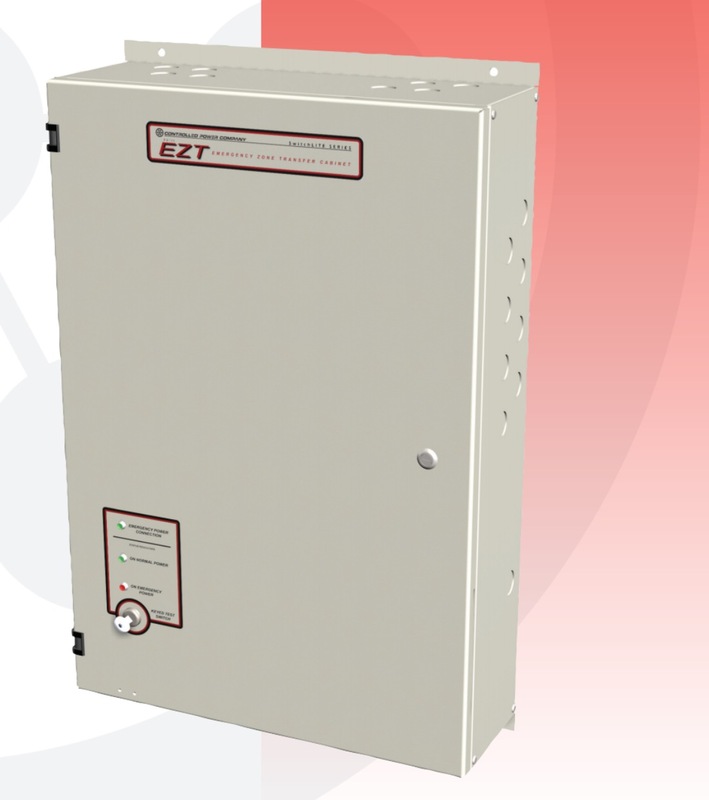 The Model EZT (Emergency Zone Transfer Cabinet) is designed to automatically transfer up to eight (8) branch circuits to emergency power when normal power fails, and then back to normal power once it has been restored.